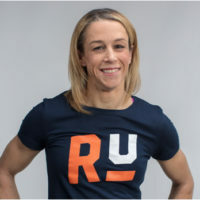 A four-time CrossFit Games athlete, a former collegiate All-American at the University of Virginia and a member of the US National field hockey team, Michelle Crawford is one of the two head coaches at Rise Up. Michelle has worked in the fitness industry for over 15 years, with experiences ranging from group exercise instructor to running her own personal training business to owning a CrossFit gym. Michelle earned her Level 1 CrossFit certification in 2008 and opened her first CrossFit affiliate, Ballantyne YMCA CrossFit, in 2010. In 2013, she launched Rising CrossFit in Ballantyne and owned/operated that affiliate gym for 5 years. When the opportunity to continue coaching and designing CrossFit classes in addition to serving the Movement Mortgage corporate community’s health/fitness needs arose, she couldn’t turn it down and relocated her gym to Indian Land, SC. Michelle has been married to her husband, Casey Crawford, since 2000 and they have two daughters, Cadie and Josie.